When you see others succeed you have two choices: You can be jealous, sulky, and bitter….or you can be proud, inspired, and motivated. One path is obviously more positive than the other, however it’s easy to wake up and realize half way down the path, you’ve chosen the wrong one. Sometimes it can be hard to not have feelings of jealousy when you see those around you succeeding, especially when it’s in an area where you are also trying to succeed. It could be your friend who just seems to have everything in her personal life falling into place perfectly, including that new baby she and her husband just welcomed to their lives. Or perhaps a colleague who started her job around the same time you did who just seems to keep snagging all of the promotions right in front of your eyes. It could even be someone who is a competitor in your line of work who is having amazing success. These scenarios are part of our lives. They are always going to happen. There are positive things happening to people all around us. I want you to choose the path of being happy for those people and draw inspiration from what’s going on in their lives. As women, we tend to struggle with these emotions and find ourselves feeling jaded. Jealousy is an ugly emotion and is a cancer to our positive energy. You’ve probably heard the expression, “Comparison is the thief of joy,” and it’s true. When you’re jealous of others, you’re focusing outward when you should be focusing inward. Use the accomplishments of others as inspiration and motivation to push forward. Consider your own accomplishments. Something amazing has happened, you’ve reached a goal, your life has taken a positive turn. You wouldn’t want other women to feel down on themselves because of your accomplishments. You wouldn’t want them to feel negative towards you, you’d want them to be happy for you and inspired for themselves. This is more the reason to not let yourself get down when others succeed. Let go of the bitterness and jealousy, choose the right path today, or turn around if you’ve found yourself down the wrong one. 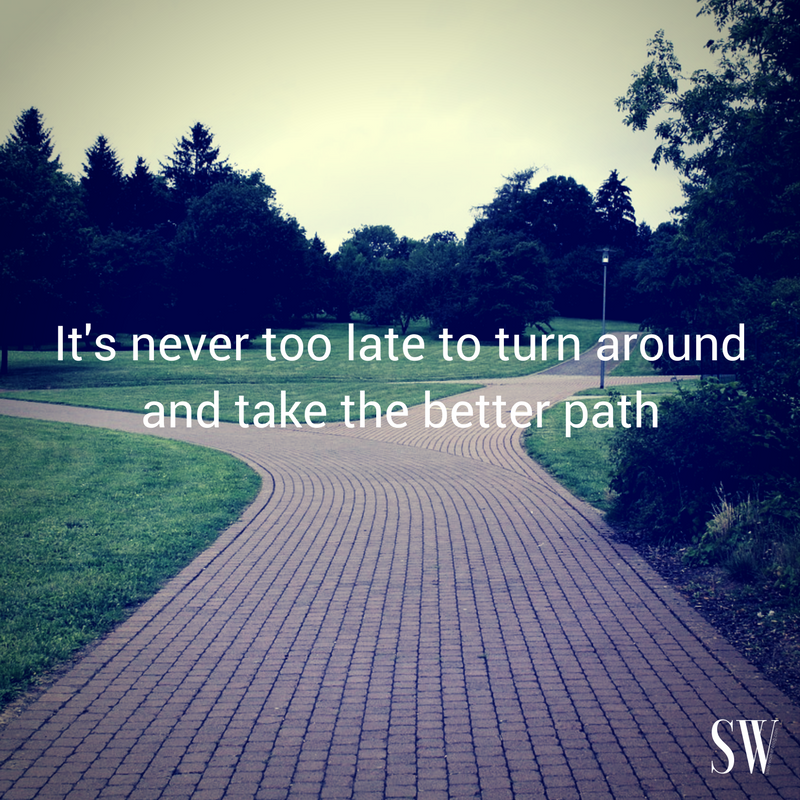 It’s never too late to turn around and take the better path.